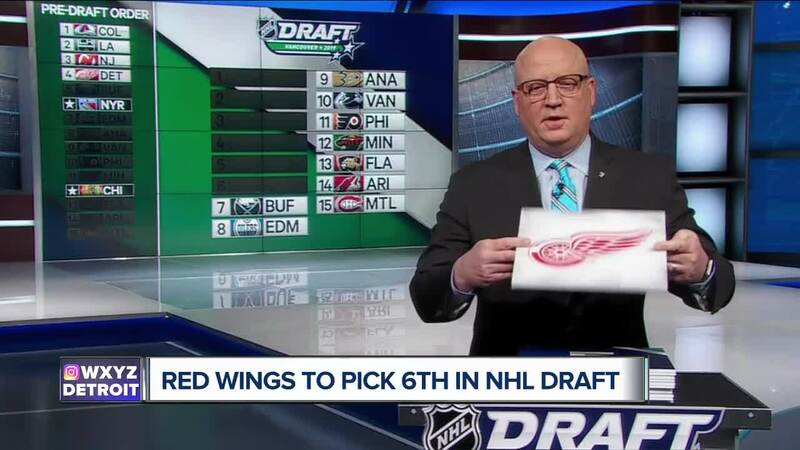 Red Wings slide to sixth spot in 2019 NHL Draft lottery. Brad Galli has more. (WXYZ) — The Red Wings know where they'll pick in June's NHL Draft. Detroit has the No. 6 selection in the 2019 Draft. The New Jersey Devils won the lottery and will pick No. 1 overall. The New York Rangers will pick No. 2, and the Chicago Blackhawks won the No. 3 selection. The Red Wings had a 9.5 percent chance to land the top pick in Tuesday night's lottery. They had a 28.8 percent chance to land a top-three selection. Because of the lottery format, the Wings also had the same odds at the second pick and third pick. The NHL re-draws for the second and third picks. The Blackhawks moved up from the 12th-best odds. The Rangers also jumped into the Top 3. “It feels like the top two would have a chance to help next year. That’s what I’m most worried about now, is can somebody come help us next year? It’d be great," head coach Jeff Blashill said on Monday. Jack Hughes is the top prospect in the NHL Draft, after playing two years with USA Hockey's National Team Development Program in Plymouth. Kaapo Kakko is right there with Hughes, after an impressive showing in leading Finland to gold at the World Junior Championships. “We’re going to add another really good player. We hope it’s a superstar. Hopefully we get lucky and we get a high pick, but we are getting a good player," Red Wings general manager Ken Holland said ahead of the lottery. Detroit picked sixth in 2018, selecting winger Filip Zadina. They slid from fifth to sixth after Carolina jumped into the top three to select Andrei Svechnikov. In 2017, the Wings slid from seventh to ninth after the lottery.